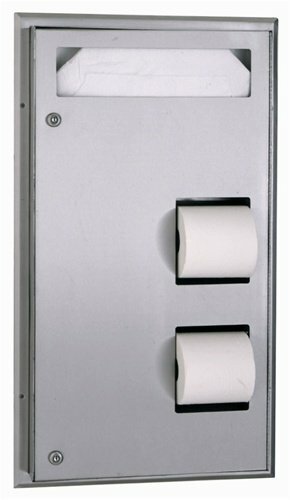 Partition mounted seat-cover dispenser and toilet tissue dispenser. Mounts centered through toilet partition. Used from both sides, serviced from one side. Holds 500 toilet seat covers and two rolls of tissue for each compartment. Theft-resistant spindles. Rough partition opening: 15-1/2" width, 28-7/8" height (395 by 735mm). Materials: Cabinet - 18-8 S, type-304, heavy-gauge stainless steel. All-welded construction. Exposed surfaces have satin finish. Equipped with a plastic sight-barrier panel for toilet-seat-cover dispenser. Flanges (2) - 18-8 S, type-304, 22-gauge (0.8mm) stainless steel with satin finish. Drawn and beveled, one-piece, seamless construction. Door and permanent panel - 18-8 S, type-304, 18-gauge (1.2mm) stainless steel with satin finish. One-piece, seamless construction. Door is secured to cabinet with a full-length stainless steel piano-hinge and equipped with two tumbler locks keyed like other Bobrick washroom accessories. Toilet tissue dispensers - 0.100" (2.5mm) thick ABS. Equipped with four theft-resistant, heavy-duty, one-piece, molded ABS spindles. Measures 17-3/16" width by 30-5/8" height.